Gardening doesn't have to be for warm-weather seasons only! Learn how to start seeds indoors to get a jump start in pretty blossoms and delicious produce. 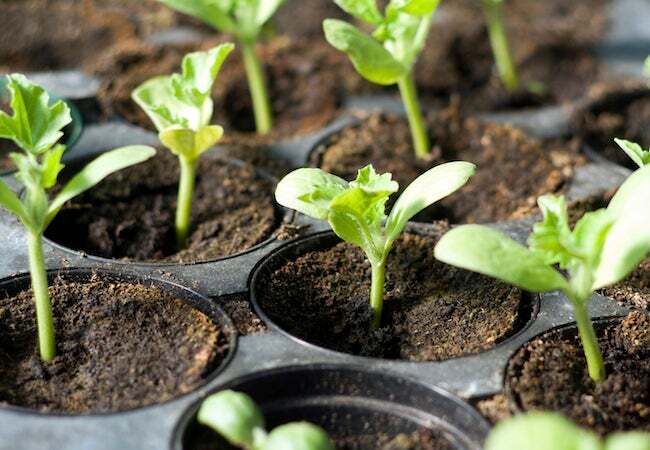 If you’re itching to get your garden going, don’t wait until the weather outdoors is agreeable—get a jump on the growing season by starting your plants from seeds indoors. Not only will you save money by growing your own plants from seeds, you’ll have access to a wider variety of vegetables, fruits, and flowers than many garden centers offer as young plants. What are you waiting for? Keep reading to find out how to go about starting seeds indoors. Stratify your seeds if necessary. Many seeds can be sown as is, but others have additional requirements. Stratifying, or chilling, mimics the overwintering cycle a fallen seed would undergo in nature. 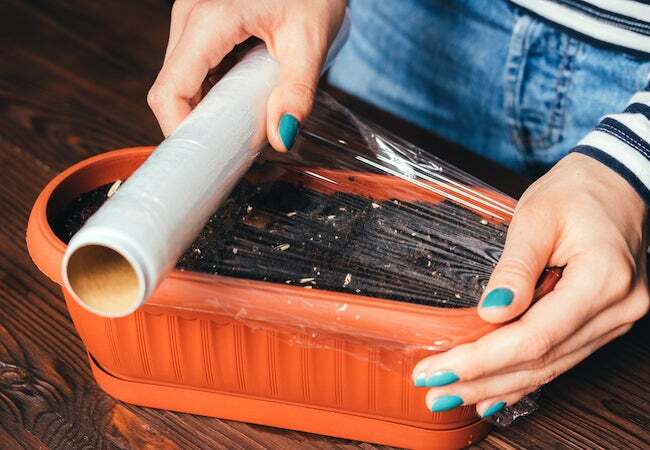 If your seed packet calls for stratifying, place the seeds on a dampened paper towel and fold the paper gently before slipping it into a zip-top plastic bag and placing it in your fridge. Depending on the seeds, they may need to remain in the fridge for one to three months; the suggested chilling time should appear on your seed packet. Scarify your seeds if called for on the packet. Scarifying is the process of nicking the outer shell of a seed to encourage it to germinate. Some seed shells are so hard that the rate of germination is low unless they get a little help breaking out of their shells. A simple way to do this at home is to chip the edge of the seed with sharp fingernail clippers—only enough to perforate the hard shell casing and no more. Start seeds at the right time. Your seed packet will tell you the best time to start the seeds. Many vegetable seeds should be started four to six weeks before the last expected frost date in your area. 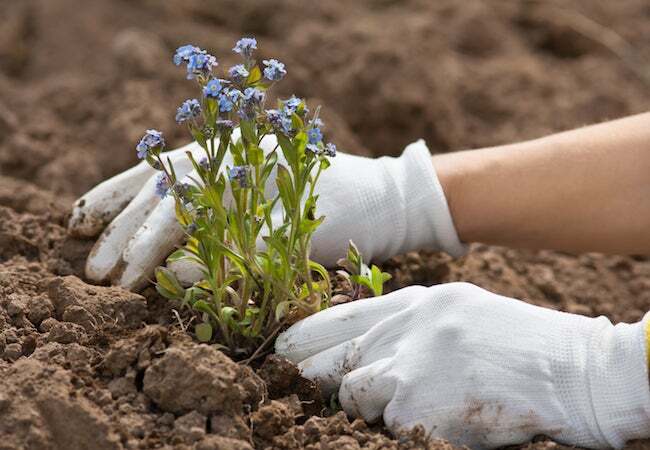 Others seeds, including many perennial flowers, should start earlier, as much as eight to 10 weeks or 10 to 12 weeks before the last frost date. If you’re starting perennials, make sure the plants will survive in your growing zone. Prep your mix for planting. Pour sterile seed-starting medium in a clean bowl adding just enough warm water to dampen it. It’s important to use a sterile mix, and not garden soil, to avoid spreading diseases to the young seedlings. Fill up your tray. Pick up a plastic grow flat or tray from your local garden center or hardware store. This long, shallow container is specifically designed to accommodate a growing plant and its roots. Distribute the moistened mix between the individual cells in the tray and fill each one almost to the top. It’s okay if your tray doesn’t have individual cells; simply spread the medium evenly throughout it. Having a tray with individual sections just make it easier to keep the roots of the seedlings separate after they start to grow. Plot out the plants. Make an indentation in the top of the planting mix in each cell, or make shallow rows if you’re using a flat without individual cells. The packet will tell you how deeply the seeds should be planted, but the general rule is to plant a seed four times as deep as its width. Large seeds, like cantaloupe and sunflower, need to be planted deeper than small, fine seeds. Drop in seeds. Allot one seed per cell or distribute them evenly in the shallow rows. If the packet says they require light in order to germinate, then don’t cover them; these seeds may be sprinkled on top of the seed-starting mix. If there aren’t instructions regarding light for the seeds, cover them with the moistened medium, patting the soil very lightly on top. Then, cover the seeds tray with a fitted plastic top or with plastic wrap to the keep the medium from drying out. Determine a spot with optimal temperatures. Depending on the germination needs specified on the seed packet, find either a warm or cool spot for the tray. Many seeds germinate more quickly if they have gentle bottom heat, which can be provided by a heated growing pad (available in garden centers) or on top of a refrigerator where it’s slightly warm. 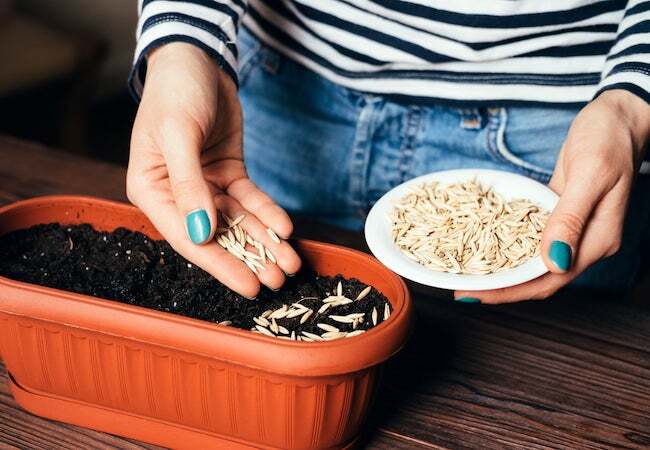 For seeds that require cooler temperatures to germinate, find a cool part of the house away from any possible sources of heat until they sprout. Check seeds daily. Germination times vary by seed type. Some seeds (such as lettuce and kale) can germinate within a couple of days, while others (including perennial flowers) can take two or more weeks. Let light in. Once the seeds sprout, remove the plastic cover and move the seedlings near a sunny window or place them under grow lights to encourage healthy growth. Don’t place them in direct sunlight where they can become too warm—a table near a sunny window is sufficient. You’ll want to water plants as needed to keep the starting mix damp, but not soggy. Know when to move. When the seedlings develop their first true leaves, transplant them into individual peat pots. The first leaves that emerge are called “cotyledons,” or “seed leaves”—the plant’s true leaves will develop next. At this point, the seedling is strong enough to be transplanted into a peat pot where it can remain until it’s time to plant it in the garden. Any good potting soil will do for filling the peat pots. Prepare spots for the sprouts. Till and prepare your garden soil in preparation for the new plants. Break up large clods and remove twigs and rocks. Most vegetables thrive in well-drained soil and full sunlight, but other plants have different light requirements, so choose a spot that’s suitable for your specific plants. Make the switch. Set the young plants outdoors in a protected area—out of the direct sun and wind—for a few days before transplanting them to the garden. Called “hardening,” this gives the tender plants a chance to adapt to the outdoor environment before you move them to their final growing spot. After hardening, transplant the young plants into the garden, leaving the peat pots in place—they will biodegrade in the soil, but you can tear off the portion of the pot that extends above the soil if you like. After planting, water the new transplants well to give them a good start in the garden!